An estimated total of 65,000 jobs is at the horizon in Haiti as the Caracol Industrial Park officially opens its doors in Nothern Haiti this coming Monday, October 22nd 2012. US Secretary of State Hillary Clinton is flying to Haiti for the ceremony. Se will speak at the ceremony, AFP reports. Mario Garnero, one of Brazil's most accomplished entrepreneurs -- AND, by the way, one of the board members of president Martelly's Advisory Council on Economic Growth and Investment of Haiti -- is also flying to Haiti for the ceremony. IN HAITI, WE NEED JOBS!!! 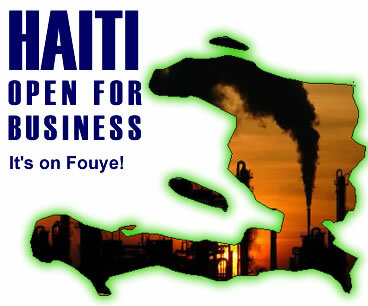 Question: What are you wishes for this new industrial park opening in Haiti? Caracol industrial park open 65.000 jobs in Haïti, great. But make sure this industry is not produce the chemical smock to harm the population of Haïti; make sure these chemical will not poison the sea including the rivers. Do you know chemical symbolize poison? It sound good to me. But remember that? US government have a lot experience to rule over countries, but they don't have any desire to see us doing better, that's why you can take 1 hour 15,minutes to com from Haïti and to go Miami or from Miami to Port au prince Haïti. Welcome to Haiti and keep the jobs coming. Mwen byen kontan pou sa nou tou rele jefo, men gen anpil bagay nou pa rive konnen e konprann. Mezanmi, endistri sou tretans pa you solisyon pou rezoud pwoblem haiti yo. Se plis mize li kreye nan peyi ke yo di ki agrikol. Nan 4 0u 5 ane ou pwal we plis mise, peyizan pwal kite pwal kite la te pou yo kapab vini lavil pou yo travay.